Frequently when discussing our approach to design, we hear people say something like, “We like your work, but we also want something green...” That has always surprised us, because we take great care to create environmentally sound buildings. However, when we looked around at the “green” buildings getting the press we realized that they all tended to have a similar style, often with bamboo floors and recycled glass countertops, and of course photovoltaic panels. Now, nothing against those features per se, but outfitting a box with these products has become a trend and not necessarily a green one, however well intended. We believe a green building takes much more into account; our approach is not a style, but a solution. Before the modern era of architecture, most buildings in most places were inherently green; their design responded to local climate, were constructed of renewable and inert materials, were durable, and satisfied practical and cultural needs well enough to be reused for generations. In what has been called the Thermostat Age, the advent of mechanical systems and industrialization allowed buildings to assume almost any form, with products from anywhere in the world, and made from anything ranging from the exotic to the toxic. The earliest attempts at creating “machines for living (and working)” were terribly inefficient by today’s standards and architects have rightly begun to address some of these inefficiencies. Too often however, the typical new “green” building relies on high efficiency gadgets and newfangled products, while failing to incorporate the time tested green attributes of premodern buildings. We feel that the notion of green as primarily a technological solution is often a case of the tail wagging the dog. We propose an alternative to the current paradigm: Renewed Green-- a union of the enduring principals of traditional architecture with carefully integrated, contemporary technology and building science. Renewed Green is Timeless—While we aren’t strict historicists, we don’t follow fads or fashions. Styles that are the most “in” today are often the most dated tomorrow. Many of us in the Bay Area live in houses that date from the turn of the century or older and often admire the many original qualities of the older structures. We strive to design buildings having character and usefulness which will be appreciated and adapted (not demolished and land-filled) by future generations. Renewed Green is Preservation—Whether a tree on a site, old growth redwood framing, or a well crafted detail from the past, we make every effort to preserve that which is worth keeping. We particularly like Richard Moe’s definition: “Preservation is simply having the good sense to hold on to things that are well designed, that link us with our past in a meaningful way, and that have plenty of good use left in them.” Furthermore, when we can find suitable items, we like to incorporate things like vintage fixtures and reclaimed materials into our projects. Renewed Green is Durable—It’s not green if it doesn’t last. We use the highest quality materials your budget will allow, and certain products like PVC windows we just won’t use, period. We prefer the least processed, most time tested materials. We don’t believe maintenance free products exist, there are only those that can be maintained and those that can’t. Renewed Green is Sustainable—While sustainability has become the marketing claim made by every other product these days, we endeavor to sift through the “greenwash.” We focus on high impact, third party confirmation for much of material specification. For framing, we always use FSC studs and plywood to the fullest extent possible. For large framing members we avoid solid wood and use engineered products made from wood scrap and smaller trees. Many finish materials, including FSC trim and wood flooring, true linoleum, and wool carpets are renewable resources found in our projects. Renewed Green uses Appropriate Technology—and of course, the gizmos...yes, we spec high efficiency programmable furnaces/ boilers and appliances, whole house ventilation, low water use fixtures and appliances, high efficiency and well controlled lighting, and when feasible photo-voltaic and solar hot water heating. Our houses consistently perform well above building code requirements, we just don’t think the architecture needs to announce that fact. Renewed Green is Healthy—We don’t like working around paint fumes any more than you do. We specify low to no VOC paints, sealants and adhesives wherever possible. We also use formaldehyde free plywood and insulation. We install hydronic heat for those concerned about potential air quality issues with forced air heating. Renewed Green is Smart—We can look at how you have used energy and resources in the past, evaluate existing conditions if applicable, and predict the new requirements based on data about your project from our building energy consultant Gable Associates. This information along with other evaluation methods can allow us to develop a plan for your long term energy needs. 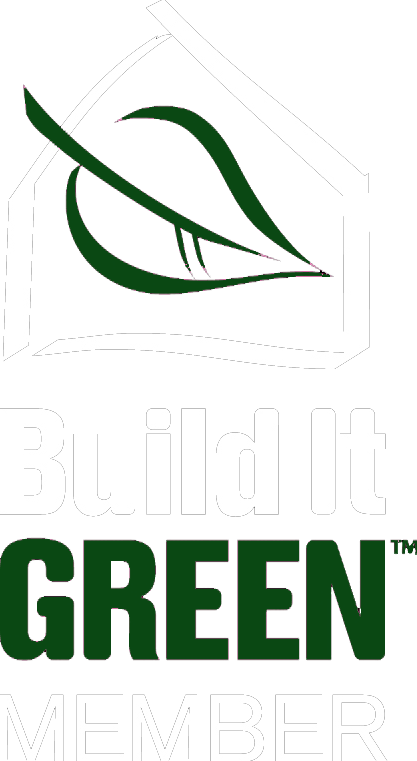 We build smart too, Berkeley Design Build is a certified Green Builder. Renewed Green Considers the Options—We have experience designing and building timber frames, straw bale, auto-claved aerated concrete block, and Faswall, to name a few. In general the evidence supports that wood framing, properly sourced and executed, is actually a very “green” choice, however certain project types do lend themselves to alternate construction techniques. This outline isn’t meant to be exhaustive, but rather highlights aspects of our approach in designing green architecture. Each client brings their own level of interest in creating a sustainable project and we happily offer our expertise, enthusiasm, and skilled consultants to make your building as green as you desire. The six-month build process that followed was professionally managed, and educational as well. Mike and Chris were clear and proactive in guiding us through the design process, keeping us informed about schedule and budget, and letting us know when our input would be needed. BDB was very helpful to us in making decisions along the way such that our project stayed on schedule. They consistently provided options with clear trade-offs so we felt we were making informed choices. Mike helped guide our selection of materials and finishes; this was invaluable in navigating what at times seemed to be near infinite options and -- more importantly -- producing a result that was in keeping with the aesthetics of our home. BDB was also incredibly flexible: They worked with us on changes in the scope of work; and they were willing to meet with us at varying times and use email when possible to discuss the project and keep it moving forward. We thus experienced the pleasure of good collaboration, yet at the same time we felt BDB led the process with integrity and strong leadership. The result is nothing short of astonishing. We now have a house that feels much bigger, is more usable, and is unquestionably beautiful. The space we added through our project is balanced with the original portion of the house and maintains throughout the Craftsman aesthetic we wished to preserve. A friend who has seen both the before and after recently summed up her impressions of BDB’s work: “It’s incredible how the perfect design and a commitment to detail can completely transform a house.” We couldn’t agree more.